He falls asleep with his head snuggled in between my arm and my chest, my face pressed into his hair. I gaze down, try to tattoo onto my memory the way his long, dark eyelashes rest gently above his soft chubby cheeks. I close my own eyes -- a test of sorts -- to see if I can remember each part of his baby face. So I take a picture from the exact angle ...though, it's never the same as what's really before me. But is anything ever really the same in mind or snapshot as what's laid out before us? Nope. Never. But still we try because that is the only hindsight we're afforded. never the same, but how wonderful we live in an age we can capture even a glimpse ay? Never. And it breaks my heart. The funny thing is my second baby is the exact replica of his big brother and yet I still can't remember my oldest as a baby. Is that odd? 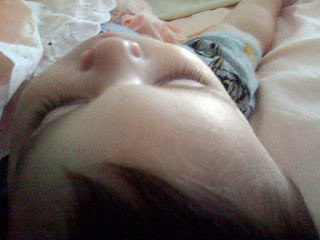 He is TOO precious : ) And you're right...it is so important to cherish these moments. So often I wanted that too. to capture it just how I saw it in the moment but never could. Oh, those eyelashes. Be still my heart. We all desire to hold on to the memories that seem to fade. Oh, why do our minds have to lose the details? I feel so grateful we have the ability to capture (and store) so much more than our parents did. So true, I think it is because a picture can never capture your heart in quite the same way. It doesn't make a sound, or smell, or feel warm, or hold your hand. Nothing is ever quite as good as that exact moment.